Fruits tree is prone to a variety of diseases that can harm the tree, reduces the yields or in certain case tree dies. 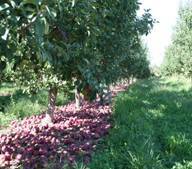 Fortunately, orchardist can avoid most of the diseases by taking chemical and non-chemical measures. 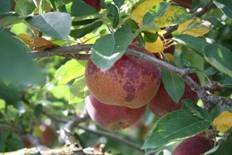 Here we have listed the most common fruit tree diseases. 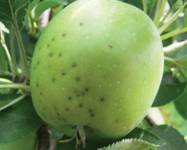 Bitter pit is a common disease that causes dark spots like freckles on apples nearing harvest season or it can be due to storage. 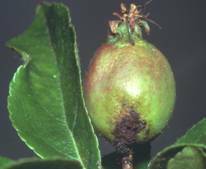 This disorder in apple is related to lack of calcium in the fruit and is often as a result of less moisture in the soil or dry soil conditions. Cause of this disorder is, mainly by low levels of calcium in the fruit and it is more common after hot/ dry summers. Small sunken brown small holes develop on the surface of the fruit and the flesh beneath the pits is discolored and dry initially it is light brown slowly or with fruit maturity it turns into dark coloured. 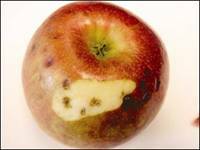 In severe cases, brown dots area of tissue are scattered throughout the fruit flesh of an infected apple and it takes on an unpleasant, bitter taste or sponge like taste. This can appear from when the fruits are about half developed until they are harvested. It is more common on young, vigorously-growing trees; especially those fed heavily with nitrogenous fertilizers; but it can also develop on fairly old trees. Correct nutrients and irrigation to maintain steady growth throughout the fruit season is the key to reducing problem of dark spots / bitter pit. Use a general-purpose, balanced fertilizer and nitrogenous (such as sulphate of ammonia) or potassium-rich (such as sulphate of potash) fertilizers, excessive use of these should be avoided. Moisture through regular irrigation should be there. Summer pruning helps to rescue the leave area of apple trees which helps to control the strength of trees and redirects calcium to fruits instead of vegetation, as well as foliage. Fruits should be kept on tree until it is fully ripe and try to avoid ripping chemicals unless required, if fruits are unripe and harvested chance are that they will be low in calcium, result is harvested affected. 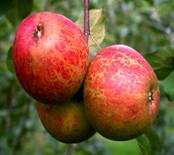 Where the brown patches only appear near the skin, they can only be removed by peeling the fruit. Fruit from trees with a recurrent dark spot problem can be stored frozen to avoid the increase of such spots. This is a physiological disorder, which reduces the fresh market quality of the apple. Young trees that are just coming into bearing are the most susceptible. Immature fruit are more susceptible to bitter pit than fruits harvested at the proper maturity stage. The tissue below the skin becomes dark and hard like cork. 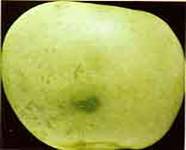 At harvest or after some period when stored the fruit skin develops depressed spots on the surface. These spots appear as water soaked spots on the skin near the calyx. The spots generally turn darker, become more sunken than the surrounding skin and get fully developed after one or two months in storage and finally fruit get rotten. Foliar calcium sprays before harvest and dipping fruits in calcium before storage control the occurrence of bitter pit. The plants should be sprayed 60 days prior to harvest followed by a repeat spray after 30 days, for better result, read the manufacturing instructions. 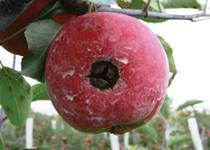 Cork spot is a disease that occurs on the apple surface most of the apple producing area of Himachal Pradesh. Although it is most prevalent on all variety mostly on Delicious, Golden Delicious, has resulted in the selection of the term “cork spot” as the area becomes hard land dry like cork. 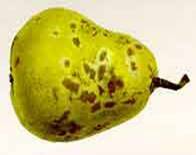 The initial phenomena of this physiological disorder appear as small blushed area on the skin of the fruit above the affected brown spot. The affected tissue is usually much harder than the healthy tissue. Boron and calcium deficiencies are occasionally found responsible for this disease of cork spot. Measures :Proper nutrient management, especially boron and calcium helps in preventing this disorder foliar spray of calcium and fertilizers can help to prevent it. This physiological disorder happens with large and over mature fruits. It can also occur when the CO concentration in storage exists & increases. The symptoms appear as brown 2 discolorations in the flesh, usually originating in or near the core as shown in the picture. 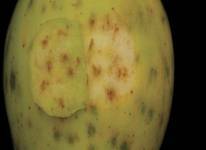 Brown areas have well defined margins and may include dry cavities developed due to act of drying in fruit. Different names have been given to the disease by different orchardists in different areas; among these are internal breakdown, core rot, and brown heart. As the names imply, the disease is characterized by softening and browning of tissues in the region of the core. Circumstances range from a small spot of brown flesh to entire browning of flesh with a margin of healthy white flesh remaining just below the skin, it develop early in storage and may increase in severity with extended storage time. Harvesting of over mature fruits should be avoided, if harvested should be properly stored. The fruits should be immediately harvested when it ripe. The CO concentrations should be reduced to avoid development of brown heart. Sun Burn is the physiological disorder of fruit occurs due to intense heat of the sun. Fruit on the sun faced area of the tree are generally affected. Water stress can also give rise to the incidence of sunburn. Initial symptoms are white, red or yellow patches on the fruits. With severe skin damage, injured areas of the fruit can turn dark brown before harvest. These areas may become spongy and than that area is sunken. Fruit exposed to the sun after harvest can also develop severe sunburn on the fruits. One of the suggested methods of control is to avoid sudden exposure of fruit to intense heat or direct sun light. Summer pruning must be carefully done to avoid sunburn. Heavily pruned orchards or orchards with less leaves should be regularly irrigated to reduce heat stress. Selection of less susceptible clones and adequate irrigation, manuring, nutrient pest and effective management can reduce russeting. 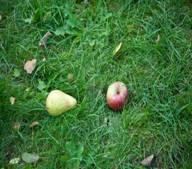 Most of the commercial varieties of apple exhibit three cycles of fruit drop: 1. early drop 2. June drop.3. Pre-harvest drop. The early drop is considered natural and is due to lack of pollination and fruit competition. Moisture stress and environmental conditions cause the June drop. These two drops neither cause substantial economical losses nor are controlled effectively by artificial means. The pre-harvest drop causes serious economic loss as the full grown marketable fruits abscise before the harvest due to the reduction in the levels of auxins. The pre-harvest drop can be controlled by application with NAA (15 ppm) sprayed 20 days before the expected fruit drop or 20-25 days before the harvest.